The ETP-900 Experiment Test Platform,consists of on board power, signal and meter capabilities in a compact portable package. The slope portion has 117 square inch of Velcro loop material designed to accept the various Experiment Circuit Boards. The ETP is ideal for off site training. Note: Existing Test Equipment can power all Dynalogic Boards. 2- 0-20 VDC @ 500MA Floating supplies. 1- 5VDC @ 2A Fixed Supply. 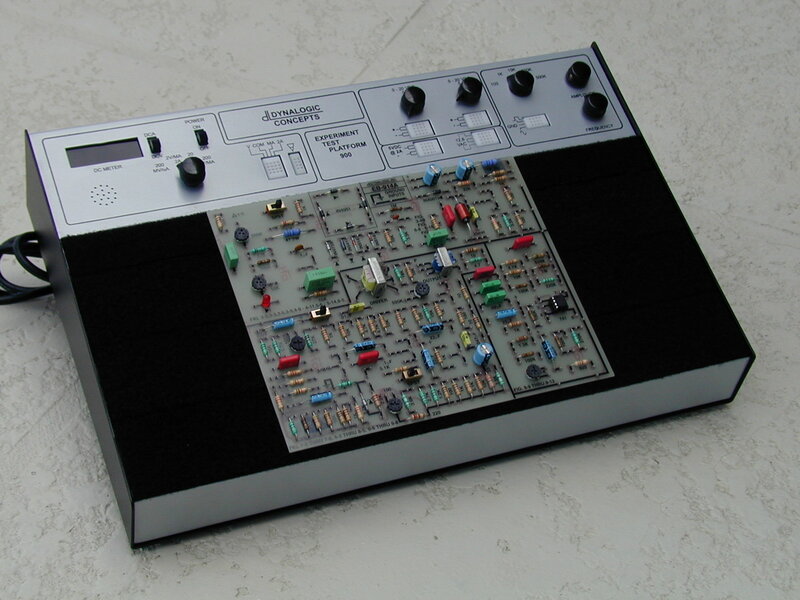 1- Function Generator. To 500 KHZ, 0-10 VPP. + 200mV, + 2V, + 20V, + 200V. DCA Measuring Ranges: + 200uA, + 2mA, + 20mA, + 2A. Input Impedance: 10M Ohm for all ranges. All ETP-900 functions are overload and short circuit protected.